The world of installing drywall relies on training and precision to ensure reliably quality across every job site. As a project manager, you will be tasked with finding an experienced drywall company to get the job done right, saving you time and money in the process. Since 1999, AZ Drywall Finishing has proudly served as your trusted drywall contractors in Chicago, delivering unbeatable results on projects across numerous industries. We understand the intricate process and variations associated with different designs. While our commercial drywall company strives to use the best materials and equipment to match our stringent standards, we understand that others may not follow such practices. 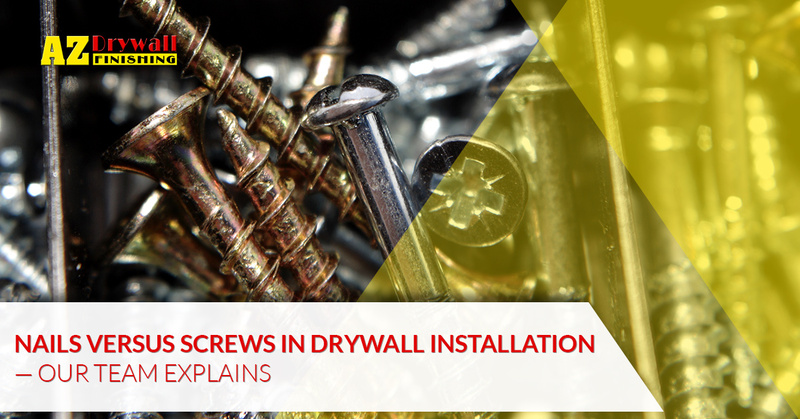 One inquiry we often cover is the value of drywall screws versus nails. Today, we’ll highlight the differences between these two fasteners, as well as the importance of utilizing the right hardware for the job. After you are finished, be sure to call our drywall finishers today for a fast and accurate quote! Lifting gypsum boards overhead and placing them on the ceiling is an intense process. Hanging drywall at this level is difficult due to gravity, a constant force that will rely on the use of screws for the best results. Some parties have made the mistake of hearing that, “Drywall nails are just as good as screws,” and have tried to hang their ceiling accordingly. When you are fighting the effects of gravity, we recommend going with screws every step of the way! AZ Drywall Finishing can help you with our scalable drywall installation services to ensure that your expectation and budget are met. Call us now to learn more! When moving to the walls, drywall nails become a much more advantageous option. This is because you can expect nearly the same level of cohesion without the costs or complications. No matter which fastener is chosen, the key to success for your project will rely on quality laborers and precise installations. Our drywall company is here and ready to achieve success for your business, whether it’s a minor remodel, facility addition, or new franchise structure. One advantage most drywall contractors and DIYers alike can benefit from with drywall nails is that they are much cheaper. The construction of a screw fastener is much more involved than a nail, increasing material costs for drywall companies. Homeowners installing drywall on their own can benefit from the simplicity and low upfront costs of nails. Investing in a screw gun will be necessary otherwise, which can spike up the costs. One aspect of your drywall installation that can also affect the total cost is your set of building code requirements. In many applications, the number of fasteners required will double if nails are used. Screws are more expensive, but the number needed compared to nails may make one choice more obvious. Be sure to balance this cost out for your project, and as always, our commercial drywall company is here and ready to assist! Both fasteners are known to hold up under pressure, but which one holds the strength advantage? Nails are are convenient, affordable, and simple to install, but their grip is not as firm when compared to the biting threads of drywall screws. Many drywall companies swear to the strength of nails, but in terms of total strength and resistance, the design of screws is much more beneficial for ensuring a secure attachment and long-lasting support. 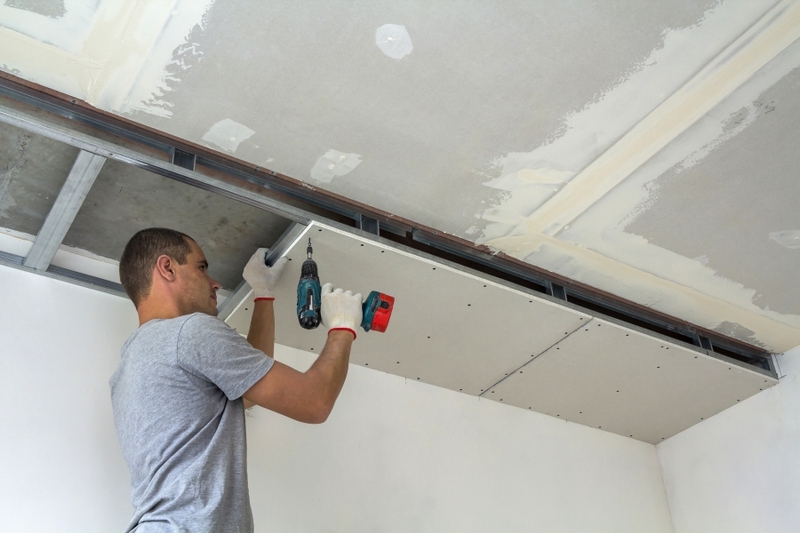 Drywall installation projects are intense, making it beneficial to save on effort and labor whenever possible to allow your teams to focus on more intensive tasks. One area where drywall nails hold the ribbon is in convenience, as screws are harder to install and remove. Drywall contractors across Chicago and beyond will tell you that the simplicity of nails helps to save time and energy across large spans. When it comes to installing drywall, a choice as small as your fasteners can yield much different results. It pays to hire a commercial drywall company with the experience and training needed to produce amazing results each and every time. Contact us today to learn more about our process and to receive your free project quote!